His Highness Sheikh Mohammed bin Rashid Al Maktoum, Vice President and Prime Minister of the UAE and Ruler of Dubai, received General Qamar Javed Bajwa, Chief of Army Staff of the Pakistan Army, at the Zabeel Palace on Saturday. In the meeting, Sheikh Mohammed and General Bajwa discussed a range of issues regarding bilateral ties of friendship and co-operation between the two countries and its people. Sheikh Mohammed and General Bajwa also took stock of the latest regional developments. While discussing the role of the Pakistani community in the UAE, the Dubai Ruler praised its constructive and effective role in the development and building of the UAE. 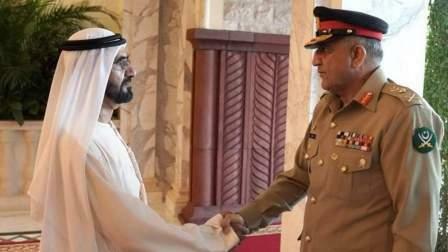 General Bajwa thanked Sheikh Mohammed for the charitable and humanitarian assistance provided by the UAE to the Pakistani people. He also spoke of the development projects being undertaken by UAE entities under the directives of the leadership, led by President His Highness Sheikh Khalifa bin Zayed Al Nahyan. He also lauded the progress witnessed by the UAE in urban, economic and demographic areas led by its prudent leadership and its balanced, moderate and open policy at regional and global levels. The meeting was also attended by His Highness Sheikh Hamdan bin Mohammed bin Rashid Al Maktoum, Crown Prince of Dubai, Sheikh Maktoum bin Mohammed bin Rashid Al Maktoum, Deputy Ruler of Dubai, Lt. General Hamad Mohammed Thani Al Rumaithi, Chief of Staff of the Armed Forces, among other senior government and military officials.